I have always loved quality watercolor paper. Without it I would be lost. Ruscombe Mills handmade paper in 300gsm (140Lb.) cold press is nothing new for me. However, this batch of Joshua Cristall historical paper is a new adventure. Morning Mist was my second attempt on this sheet. I’ll show my first try in a moment. I am accustomed to painting with fairly controlled washes where I can predict and/or manipulate the effects on the surface. Well, this paper gave me some surprises. Now I don’t consider this to be a bad thing. All of us need a challenge to wake us up. This paper has a high linen content and I am told that there is also a measure of hemp in the sheets I ordered. The paper is beautiful and while I have stated unpredictable; I need to clarify my comments. Remember this is handmade paper and is a bit different from previous batches I have ordered. In this case it behaves as if one side of the paper reacts like a hot pres sheet while the other side acts like a cold press surface. Morning Mist was executed on the side that reacts like a cold press surface. 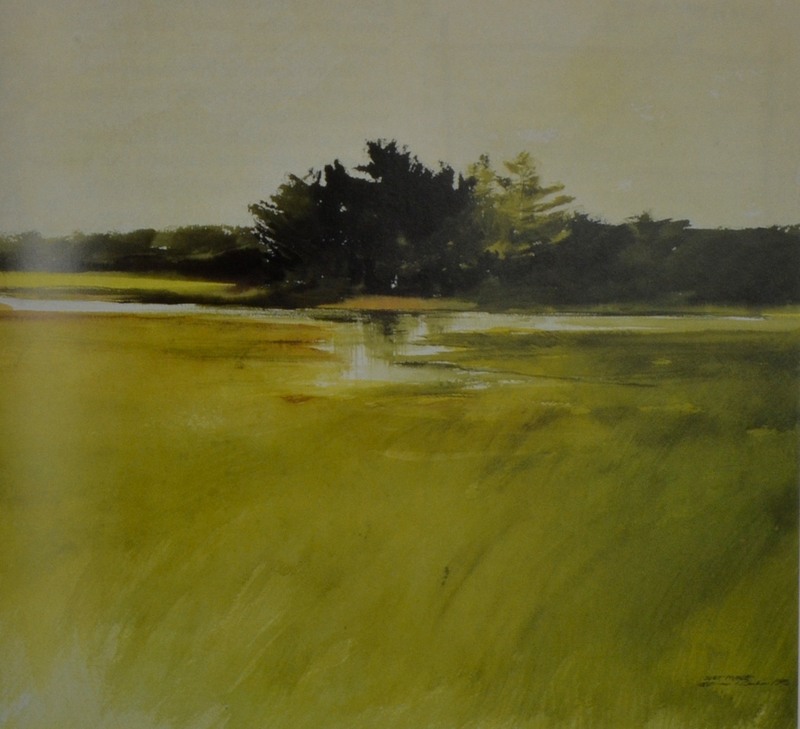 The color hold out is quite good and while there are a few layers of glazing washes; a great deal of the approach was direct and spontaneous while some of the grass texture is dry brush. The foggy areas are the result of wet ‘n wet washes and you can see them crop up in numerous places in the back ground and foreground. The highlight of the lake surface is the pure white of the paper. I really like the effects this paper produces and can’t wait to start another group of paintings. While moving my studio I found some old sketches from 1968! My wife accuses me of being a pack rat. At any rate I have some canal sketches and one intriguing group of the gondola factory that was on a less traveled portion of Venice. I was 25 years old and fresh out of art school when we arrived in Italy. In Venice I walked and sketched some of the areas that John Singer Sargent captured in watercolor. I never painted from the sketches but I think now I am ready to give it a try. At the time I painted this I really didn’t like it too much. I’m still not wild about it but I am showing it for a reason. This sheet is the other half of the sheet that was used for Morning Mist. This was the first attempt I referred to earlier in this post. This was the flip side of the paper, the side that exhibited “hot press” tendencies. One particular thing that will immediately stand out is the texture of brush stroke in the background. Hot press papers tend to show brush strokes and pose a bit of a challenge with layered washes for the previous wash will often lift very easily. When I was learning to paint egg tempera I was required to paint on hot press and plate finish paper. The reasoning was that properly prepared traditional gesso (not the commercial acrylic kind) presented a very smooth surface. One had to learn to deal with the crawl of ink wash on the smooth surface. In actual practice I’m not so sure that it is a really big deal. However, that is the way we were taught. On the plus side the color is very vibrant. I’ll be playing with this surface some more. Both sides of the Joshua Cristall paper invite a lot of spontaneity. I really like having the paper on hand. If you are a watercolor painter you might want to give it a try. I know I plan to always have plenty of Ruscombe Mills paper on hand. Some of you may know that for several years I have been conducting on line watercolor classes. Those offerings have been pretty successful with over 500 students. One limitation is/was limited interaction with students. As I get older I prefer to have more painting time. In spite of that I still enjoy sharing watercolor. I am just curious about how many of you would be interested in an interactive on line class. This would involve each student being able to post their work and for me to comment and to do impromptu demonstrations of various visual problems. Sort of like taking requests. Students would be able to post privately or perhaps post publicly for all enrolled students to see and learn from written critique. The contact hours would be set on a given schedule and the numbers would be limited. I realize that this is a vague outline but send me an email if you think you would be interested in such a program. Interested in knowing more about the watercolor glazing technique? Mastering Glazing Techniques in Watercolor by Dr. Don Rankin is available direct at www.createspace.com/3657628 . A revised and updated edition of the original classic. Perhaps this painting needs a bit of explanation. This goes against the old maxim that if you have to explain it, its no good. There is a story here, at least for me. I have painted at least three pieces on this site. Each one is connected to the place. This area was once a bustling American Indian community. Portions of this stream was lined with white clay and the running water was clear. I recall being shocked at finding the white clay tile lining a portion of the stream. Who put them there? Was it done by the original community? Questions for which I have no answers. Many of the trees are magnificent Beech trees. Their bark is smooth, yet rugged, and in some ways resemble concrete pillars. The light changes with the season and the time of day. Time and water has eroded portions of the stream bed wall revealing a network of roots that nourish the growth along the banks. There is a presence here. You can feel it if you quietly sit or walk among the giant trees. Even in the dead of winter the Beech trees often hold on to a few of their summer leaves. At times they curl and become almost transparent in the winter sun but they hold on none the less. I see them as a silent testimony to the original people of this land. They remind me of the ones who did not get swept away in the Trail of Tears. The ones who still call Alabama their home. I was there on a chilly winter morning with the rising sun burning through the morning mist with only the sound of the quietly running water as it slowly made its way through the old camp. Needless to say I am delighted to be a part of the exhibit. Since we had such a brutal winter last year I opted to submit “warmer” subjects. A lot of folks don’t need snow and ice reminders! We will see if that was a wise choice. It has been 30 years since my first book on watercolor glazing techniques, Mastering Glazing Techniques in Watercolor was published. According to the publishers it was the first authoritative book written exclusively on the subject. Since that time a lot of other books and DVDs offering their ideas on the subject have flourished. While that is fine; in some cases some offerings have only spurred confusion. In an effort to clarify some areas of confusion I will attempt to state my premise regarding the method. First, watercolor is a glorious medium and needs no defense from anyone. One of its greatest attributes is the ability to convey crisp brilliantly fresh washes. For me the last thing I would want to do is destroy that quality. However, some may have carried things a bit too far. Glazing should enhance the transparent quality of watercolor not create a dull field of opaque color. I had one painter proudly proclaim that he had used 50 layers of wash in one of his pieces!! My immediate thought was WHY??? I have heard other questionable feats as well. The objective should be to create and/or enhance the crisp transparent qualities of the medium. If you want to build up and eventually kill a passage of wash then switch to another medium. My reply to that obvious question is to use good judgement. While it is true that you can produce vibrant layers of multiple washes it is important to know something about the nature of your chosen pigments and observe a logical procedure. One important guideline is to allow each wash to dry completely before another wash is applied. There is some leeway here and experience is your best teacher. However, wisdom dictates that you work with your paints to gain more insight. You can also check the archives of this site and see some exercises. My goal is to produce rich yet transparent color. I’m going to share some sequences with you that took place in Paradise Creek. Miniature pieces can often be more problematic than larger works. I consider them to be intricate like a fine Swiss watch. Regardless of size I often use this approach in larger works. Part of my goal is to portray the scene while allowing “accidental” surprises to enrich the development of the painting. Yes, it IS very wet. The sequence is critical. Three colors were selected, M. Graham New Gamboge, Holbein Leaf Green and Mission Yellow Orange. The paper, 140 lb. cold press D’Arches, was completely dry and the washes were applied to dry paper over a rough pencil sketch. The sketch was there primarily to allow my students at Artists on the Bluff, in Bluff Park, Alabama get some idea of the concept. The wash was applied in broad sweeps and then I used a fine mist from a sprayer to hit the still damp washes. Since the paper was at an angle you can see some puddling. Beginners beware of those puddles. If left to dry on their own they will create unsightly “explosions” on your paper. While they can be removed with some care, once they are dry, the best method is to carefully blot them without disturbing the surface. The object is to get rid of a lot of white paper while carefully reserving some key areas. What appears to be haphazard is actually a part of a plan. I want to keep the feel of a loose on the site watercolor. The first wash helps loosen up what could become tedious and stiff. Only a small yet critical portion of the paper needs to remain white. Many of the later elements will appear to be bright when areas of the basic wash are left untouched as the painting progresses. The three colors begin to merge but if you look closely you can see some of the green on the lower left side and some of the orange on the right side. The blending is uncontrolled and will produce subtle effects that can’t be obtained in any other way. The darker green wash was applied after the paper had dried completely. For some the drying time is nerve wracking. However, if you paint outdoors a lot, sometimes the drying is so fast that you barely have time to work. The green was a Permanent Sap Green. In the upper portion of the page you will see some “explosions” that were allowed to form because they suggest foliage. In this sequence the upper part of the paper was sprayed with a bit of water in a fine mist. The green shapes in the lower right were applied to dry paper. This is one of the basic rules. A wet wash on dry paper will produce a definite edge. Edges on moist paper will be soft. While this is very basic I often see students who quickly forget the simple yet profound basic elements. Step 3: In some spots you will see splatter in the foliage along with darker deliberate strokes with a pointed sable round in the foreground. The blue in the water is American Journey Andrews Turquoise. The darker greens are a mixture of Permanent Sap Green and Thalo Blue. The darker tree trunks were applied to dry paper using a mixture of Mission Yellow Orange, Permanent Sap Green, a bit of W&N Perylene Maroon and Thalo Blue. The object is to create an optical black. As you examine this example you should be able to see areas pf the creek where the turquoise blue was mixed with sap green in the middle ground. It is always good to make use of your colors in various areas of your painting in order to achieve a pleasing harmony. As you look at the last example you should notice how certain areas appear to be almost white. In step two we don’t see that much remarkable contrast. So what happened? The steps you see here are the actual steps. So what is the answer? Colors react to one another when they are juxtaposed. In this case the contrasting darker values begin to create very nice contrasts. A lot of this could be considered accidental. Personally I prefer to call it serendipity. Far too many times a person will carefully sketch on their paper and then try to follow all of the lines. In most cases, this results in a stiff dead work. If you will think about the values of your color you will find that you can begin very loosely and refine as you develop the work. Here is another example of starting off with a loose concept. The section of blue caught my eye and was the reason for the beginning of this piece. Once again a very simple palette, M. Graham New Gamboge, Permanent Sap Green, and American Journey Andrews Turquoise plus a bit of red.